Gnaoua Festival . Essaouira . Known as the "windy city," Essaouira is Morocco's wind-surfing capital, where the sky is ablaze with multi colored kites from dawn to dusk every day.Flashback 2002Here we are, basking in the noonday sun on North Africa's Atlantic Coast at Essaouira, Morocco, following a journey of discovery which began in the Imperial City of Fès and continued via Rabat, Casablanca and Marrakech. In a few days, we will drive south to the resort city of Agadir, with its luxury beach front hotels and lavish casinos, catering to the jet set of Europe, Africa and Middle East. 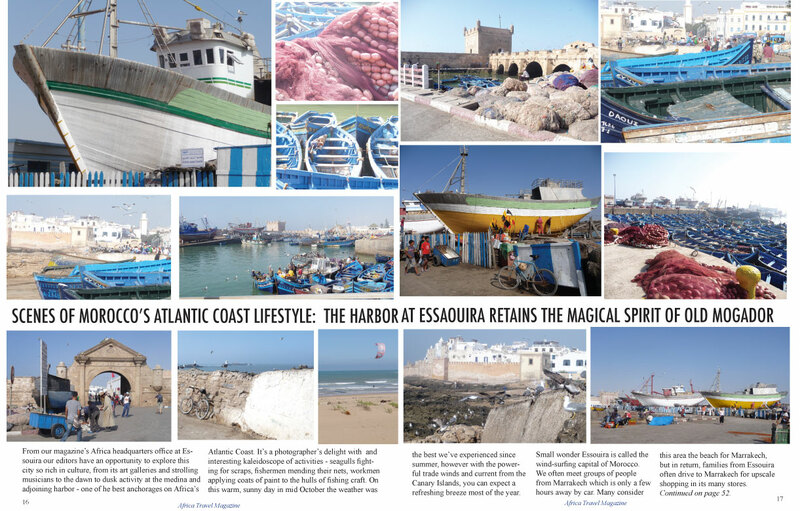 Most North Americans have yet to really discover Morocco's coastal resort cities - and that's a prime opportunity for our magazine, read by travel professionals and their clients. We are enjoying a nautical view of Essaouira's historic seaport, once known as Mogador, from our dockside table at " Chez Sam. "Highly recommended by locals in the know, this charming waterfront restaurant is surrounded by fishing boats and marine activity. Men repairing fish-nets, shucking shrimp and sorting sardines, looming skeletons of boats under construction add to the scene. The interior of Chez Sam reminds me of Trader Vic's, once a popular hang-out in our home port of Vancouver, and Ivar's in Seattle. The fresh seafood, decor and atmosphere are magnificent and the impressive gallery of celebrity photos; Louis 'Satchmo' Armstrong, Stevie Wonder and others, attests to the fact that the owner comes from the world of jazz. Sam and his huge, jet black dog Nikita joined our table a few days later, and thanks to that rendezvous, I was able to learn the history of this outstanding restaurateur and the origin of the Essaouira (Mogador) seaport's most popular eatery. One of my favorite meeting places in Essaouira is the 5-star Sofitel Mogador, located on the main promenade facing the beach. Here's where we spent one of the most enjoyable New Year's Eve celebrations in years. It started with an invitation to a Fashion Show, which continued into the wee hours. For starters, the hotel's dining room staff were all decked like Aladdin (of the lamp), and the entire ballroom looked like a scene from Arabian Nights, complete with belly dancers, mariachis with their Spanish guitars, Magicians and special visual and musical effects. The entire evening was unforgettable. We then moved to the hotel's beach side restaurant, where the music was going full tilt. One of local girls modeled Muguette's bottle- green gown with shoulder wrap- one of several gifts we received from our friend and former Tourism Minister, Hon. Sylla Diakite of Conakry, Guinea. The Moroccan Khaftan fashion segment of the evening proved highly popular. Another friendly, convenient place to meet is the Hotel des Isles. Next to the Medina and offers a full range of services. Since we spent almost two weeks in the immediate area, we are pleased to recommend a stay in Essaouira to any traveler looking for something different. 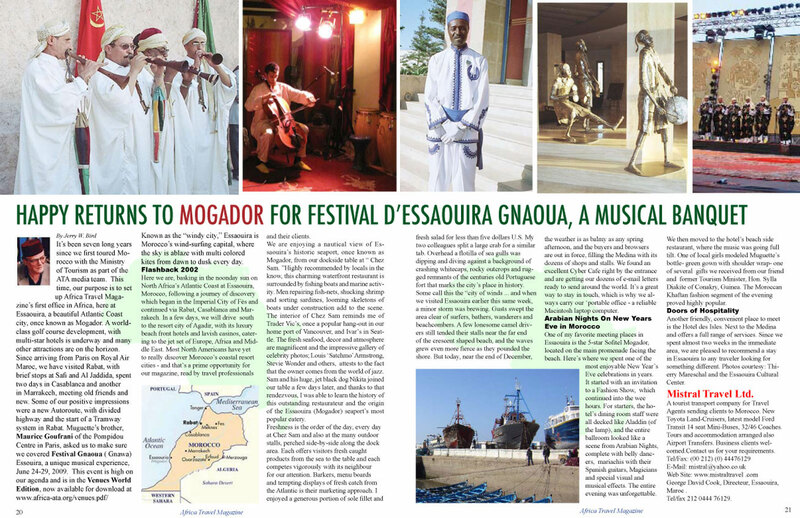 Photos courtesy: Thierry Mareschal and the Essaouira Cultural Center. A tourist transport company for Travel Agents sending clients to Morocco. New Toyota Land-Cruisers, latest model Ford Transit 14 seat Mini-Buses, 32/46 Coaches. Tours and accommodation arranged also Airport Transfers. Business clients welcomed.Contact us for your requirements. George David Cook, Directeur, Essaouira, Maroc .